While Israelis slowly come to grips with the panic and chaos that weighed down the first days of the Yom Kippur War, Syrians are celebrating 37 years to the campaign "that broke the invincible Israeli army myth." 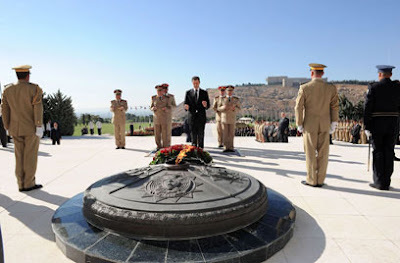 Syrian President Bashar Assad laid flowers on the Unknown Soldier's grave on the war's anniversary Wednesday. A ceremony marking the anniversary was attended by Assad, the Syrian defense minister and military chief of staff and a PLO representative. Twenty-one shots were fired. The president read out Koran verses in memory of the fallen Syrian soldiers. General Naif al-Akel (res.) told the Syrian news agency that the 1973 battles should be viewed from an historical standpoint. "The Arabs were the initiating party and they broke the Israeli army myth," he said. Al-Akel said he was a member of the force that climbed Mount Hermon and waved the Syrian flag. "The liberation of the Hermon had a huge effect on the combating forces since the Israeli occupation army previously tried to re-conquer the site unsuccessfully," he said, neglecting the fact that the IDF did eventually manage to seize the Hermon before the war ended. The general further noted that the Yom Kippur War had been the first in which Arabs showed a united front, omitting the fact that Jordan did not take part in the campaign.